When Catherine arrived her father and stepmother had Hannah aged 4 and Owen aged 14 months. (Mary’s son James Carey presumably lived with them and he was then 9 years old.) Catherine would have been of help in the house. As Catherine settled in with her father and his new family James’ good behaviour faltered. After four years of good conduct he got into a fight at Kingston on July 2 that earned him three months hard labour; back he went to the Prisoners Barracks spending time grinding wheat on the treadmill. A short taste of the old punishment cycle was enough to put him back on the straight and narrow and his sentenced was remitted in order that he could be assigned to Mr. Patterson of Liverpool St. on 15 September 1857. His reformation was confirmed when he was granted his Ticket-of-Leave on 1 December of that year. The Ticket-of-Leave was the fourth and last degrees in the convict system it entitled the holder to work for his own benefit and acquire property but was still subject to convict law could not change his residence without permission and had to attend muster and church parades. Patterson operated a small brewery at 192 Liverpool some fourteen houses away from the McCarthys. Hence we have a plausible explanation of how James and Catherine met and married two years later. The 1858 municipal roll lists James as living nearby at 94 Bathurst Street where, on January 8 1858, he sought permission from the Comptroller-of-Convicts to marry another ex-convict Mary Anne Hanley but this was refused. This set back did not affect his new outlook on life for two months later further 'meritorious service at a fire' was rewarded with a one year deduction from the time he still had to serve before receiving a pardon. In July his second application to marry was approved and so, on 9 August 1858 in St. Joseph's Roman Catholic Church, he married Catherine McCarthy. The vows were witnessed by David and Mary Virtue who attested their marks to the certificate. David Virtue was never a convict in Tasmania and is recorded as a free man when Ann Crafton (or Crofton) requested permission to marry him in July 1854. She was a 'housemaid' transported for seven years in 1852 on the Duchess of Northumberland and arriving in Hobart on April 21 1853.The Duchess of Northumberland carried 219 female convicts on what was the second last convict voyage to Tasmania. Ann Crafton was 26 years old when tried in Perth Scotland for stealing £60 in Dundee. She was also said to have three convictions for drinking and 'had been on the town for twelve months.' The surgeon reported her conduct as good and she was pardoned in July 1856. David and Ann Virtue had five children Christina (b. 6 Aug. 1856 in Hobart), Mary Ann (b. 10 Jan. 1860 in Brighton), James (b. 10 May 1865 in Longford), David (b. 17 April 1867 in Longford), Ellen (b. 16 Nov. 1868 in Longford). David Virtue died in Longford in 1887 aged 64. Comparing the handwriting on the certificate with the signature on later birth registers suggests that it was completely filled out by James (except for the signature of Father Woods.) James declared his age to be 28 confirming that he transported at age twelve: Catherine was 20. 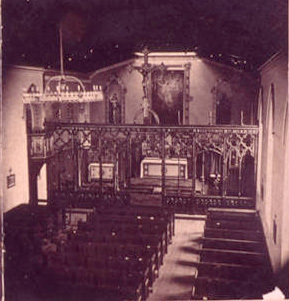 St. Joseph’s was the first Catholic Church in Tasmania and had been completed in 1844. The marriage was celebrated by Rev. Charles Woods an Irish priest who arrived in Hobart in 1851 and seems to have been the family's religious advisor as he also baptised eight of their eleven children. Woods was well educated and studied at All Hallows College Dublin and served in Hobart for forty five years until his death in 1896. 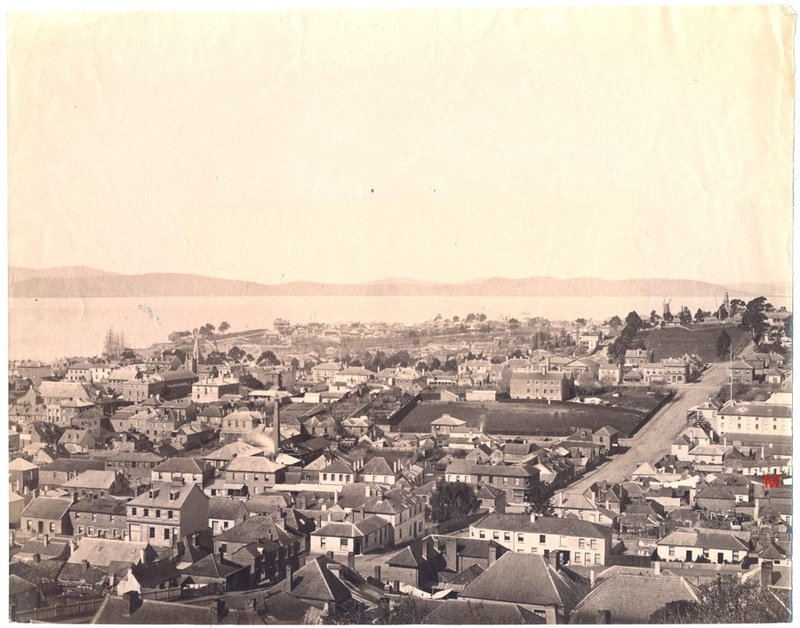 Tasmania was now 'free' and with a degree of self-government but the discovery of gold in New South Wales and Victoria began to drain the colony of workers and depress the economy. James was now almost thirty and although still on Ticket-of-Leave, could look forward to a life of freedom in Tasmania. He was granted his pardon on 24 May 1859 sixteen years after leaving England on the condition that he would not return to England. He took up the pardon later the next year. James and Catherine had eleven children in the sixteen years after their marriage six boys and five girls. After the marriage James joined the household of Florence McCarthy and Catherine’s step mother in a house with stables at 228 Liverpool Street owned by William Berry. A short distance west of the junction of Liverpool and Barrack Streets a cul-de-sac called Moodie’s Row ran southwards to the Rivulet. Fifteen dwellings all with yards lined the Row. Number 228 was on the corner of the Row and Liverpool Street opposite a hotel, then called the Rob Roy. Their first child Elizabeth was born there on 7 June 1859 and a second Margaret followed less than a year later. Both were registered by their mother. She made her mark in the register and the father was listed as James Harris, a brewer of Liverpool St. Catherine’s aunt Mary McCarthy was born in the Liverpool St house midway between the birth of Elizabeth and Margaret. Barrack Street in 1880. It runs diagonally across the photo from the lower left. Moodies Row is on the right marked with a red ‘M’. James Harrison’s family lived much of their life in the foreground of the photo. Catherine bore another nine children at regular intervals over the next fourteen years. All were baptised at St. Joseph's in Hobart with the god-parents listed above. The birth of an unnamed male child of James and Catherine Harrison was registered on April 19 1862 but there is no record of his baptism at St. Joseph's. Perhaps this boy died at birth. It is interesting that there are no McCarthys amongst the godparents to the children. They appear to have been all drawn from the friends of James and Catherine. Mary Hake (nee Connor) was an ex-convict (arrived on Arabia )who married another ex-convict, Alexander Hake (arrived on Sander ) on 6 Nov. 1849. Bridget Leech (nee Carson) was a country girl from County Galway transported for 10 years in 1849 for killing a heifer. In Nov. 1853she married James Leech, a sailor in St Georges Battery Point. They lived in Goulburn Street and later in Molle St. They had at three daughters Mary, Margaret and Ann and a son Robert who were all baptized at St Joseph’s between 1854 and 1863. In 1858 they lived in Molle St. Bridget died in 1903 aged at 80. ▪	Honora Foster (nee Connor(s)) was the wife of John Foster they were married in June 1852 when he was 24 and she 17. they had at least two daughters Fanny and Honora baptised at St Joseph’s 22 Dec. 1859 and 15 Nov. 1864. Perhaps Mary Hake and Honora Foster were sisters, possibly daughters of Ann Connor presumably Irish friends of Catherine. (Ann Connor was transported on the Sir W F Williams). ▪	Thomas Ryan married Bridget Joyce, 22, on 24 Sept. 1855. ▪	Bridget Cahil (nee Hogan) was married to Patrick Cahil and had at least one child, Bridget baptised at St Joseph’s 31 June 1858. ▪	Catherine Jones (nee Kelly) was married to Thomas Jones and they had at least one child, Mary Ann baptised at St Joseph’s 19 October 1861. Another Catherine Jones (nee Ronehan?) was married to David Jones. ▪	Johanna Conroy (nee Hallinan) was married to Michael Conroy and had at least one child, Michael, baptised at St Joseph’s 11 Dec. 1859. ▪	Bridget Stannard (nee Abbott vel Burns) was married to William Stannard and had at least one child, Francis Albert, baptised at St Joseph’s. ▪	John Burke was married to Sophia nee Neeme and had at least one child, May Jane, baptised at St Joseph’s 10 Nov. 1864.